protein rich foods for pregnancy. vegetarian high protein foods for pregnancy. 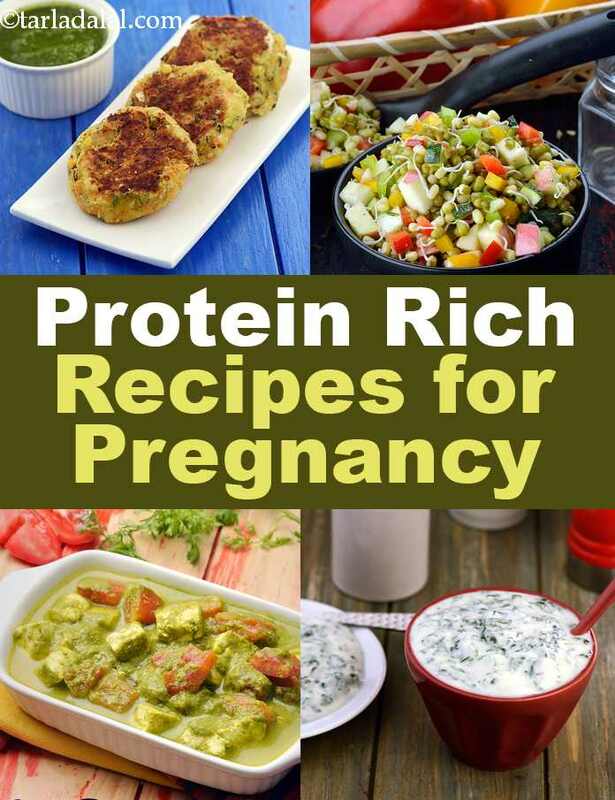 Additional protein, i.e., at least 78 gm of protein per day is required during Pregnancy for the rapid growth of the foetus, for the enlargement of the uterus, mammary glands and placenta, formation of amniotic fluid and storage reserves for labour, delivery and lactation. Besides this, protein is also required to build strong bones and teeth (which start growing at about eight weeks). So, ensure that you get enough protein throughout your pregnancy, especially during the second and third trimesters, when your baby is growing more rapidly. 1. Dairy products like milk, curds, paneer, cheese and buttermilk. 2. Pulses and lentils like moth beans (matki), kidney beans (rajma), bengal gram (chana), etc. (Try sprouting them to increase the calcium and protein content, and ease digestion). 3. Vegetables such as green peas, broccoli. 4. Nuts and oilseeds like sesame seeds (til), almonds, walnuts, cashew nuts, etc. Moong Dal and Paneer Tikki are marvelous mix of moong dal and paneer with ragi flour and spices lends itself to the preparation of tasty, protein-packed tikkis that please the palate and maintain your bones cells. Multiflour Idli is easy to make and has a fabulous, rustic flavour and interesting texture that you will enjoy thoroughly at any time during gestation. When you are too lazy to cook on summer evenings try your hands on this quick and easy to make Fruit and nut milkshake, a perfect evening snack for pregnant women. With 7.7 gm of protein per glass, this energy and nutrient dense drink will surely boost the growth of the foetus. You can have this Poha Phirni which is a rich source of calcium, iron and riboflavin. Panchmel Dal is a wholesome combo of five dals is flavoured with a special masala water and whole spices as well! Not only the flavours of the spices, but the flavours of the assorted dals are also discernable in this delightful dish. Have it with your favourite roti or paratha to enhance its protein value. Cook this Bajra and Moong Dal Khichdi when you are bored with the same old rice khichdi. This is a traditional Rajasthani recipe that we discovered is an excellent source of protein, iron, folic acid and fibre. Its creamy consistency and mild flavours make it a good recipe to have especially in the preconception period and first trimester. Paneer and Tomato in Green Gravy is so tempting to look at and is sure to make you drool. Paneer and curds used in this recipe give you vitamin B2 along with protein and calcium while the tomatoes lend folic acid for the development of your baby’s brain. Enjoy all our protein rich foods for pregnancy. Explore more varieties in our pregnancy section everyday. Poha Phirni, poha is a rich source of iron as the rice is beaten in an iron mortar-pestle. Besides adding a colourful touch to this unusual phirni, fruits like apples and bananas also provide vitamins, minerals and fibre.